Update 4/9/13: I have added photos that I neglected to include when I originally posted this yesterday. 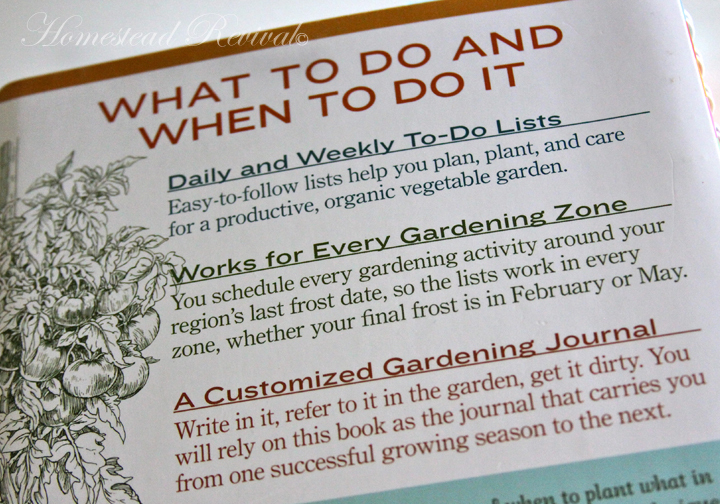 I have FINALLY found a gardening journal that I can recommend wholeheartedly! 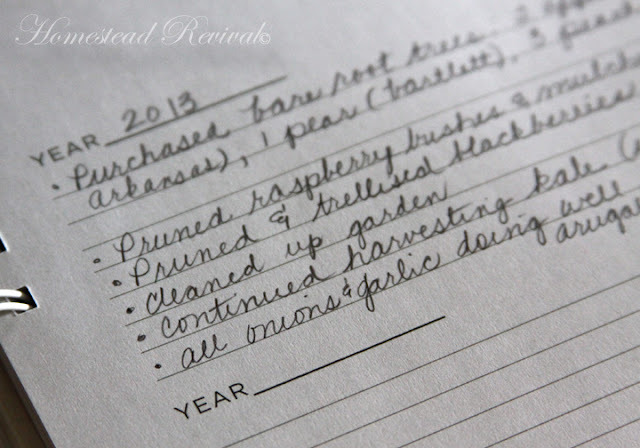 I do love organization and yet for some reason, I've had a terrible time trying to remember what to plant when. I'm finally getting the hang of the big picture and a general idea of what to do when and I understand the concept of working from the first and last frost dates, but... remembering the specifics? Now that's another story. I've used charts, sliding things (similar to wheels you turn and line up with a date), on-line programs... you name it, I've tried it. 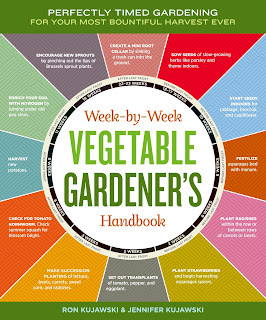 So you're probably wondering how the Vegetable Gardener's Handbook makes it so much easier? I'm glad you asked. • You Insert Your Own Dates. The "chapters" or sections in this handbook are broken up into the various weeks based on how far out they are from the last frost. 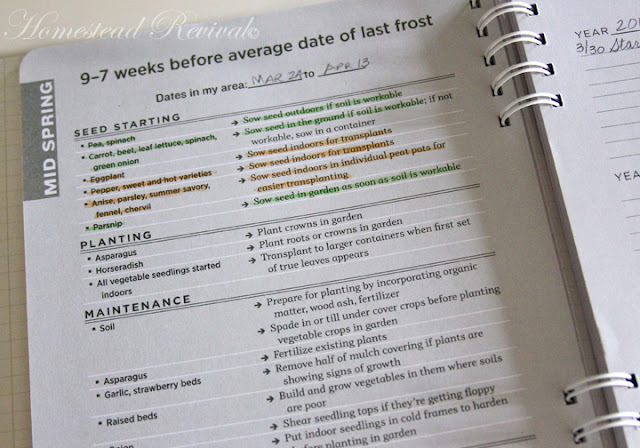 For example, if the top of the page says "20-19 weeks before average date of last frost", I would insert Jan. 6-19 on the line that reads "MY DATE: _______" since my last frost is usually around May 31. (A few read something like "17 weeks after average date of last frost".) I went through the entire handbook and inserted all the correct dates so that it was ready to go for the whole year. Now all I do is look for the matching date and I can read what I need to be doing for THAT particular week. * NOTE: If you live in a warmer climate, I suggest you fill in your dates a bit differently. The darker colored pages include a side label for the season, such as "early summer", "mid-summer", or "late summer". I would fill in your dates so that the weeks coincide with the correct time of year or season. (See pages 22-23 in the handbook for more information on how to fill in your own dates). It would be nice to see an actual "southern" version of this book in the future. • Seed Starting. Each week of the year, seed starting guides are given depending how far out you are from the last frost. 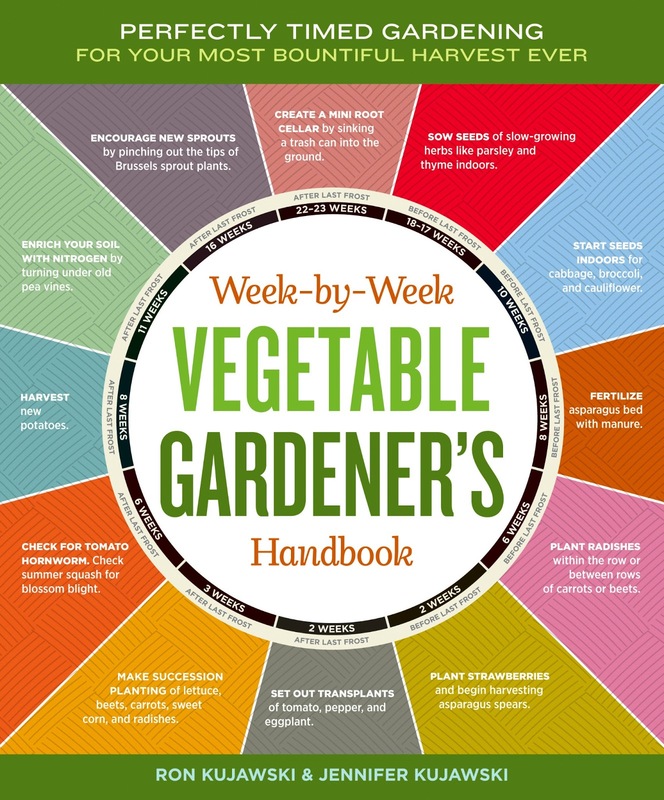 One would think there isn't much to this, but the authors have something for almost every single week of the year! Herbs, succession plantings, what to direct sow, what to sow indoors, what should be sown in peat pots for easier transplanting... they've thought of it all! • Planting. This weekly section includes items you should be planting directly in the garden as whole plants. It may include things like asparagus crowns, but it could also include your seed starts or even cover crops. • Maintenance. Ever forget to do the small things that make a big difference? You won't forget anymore. 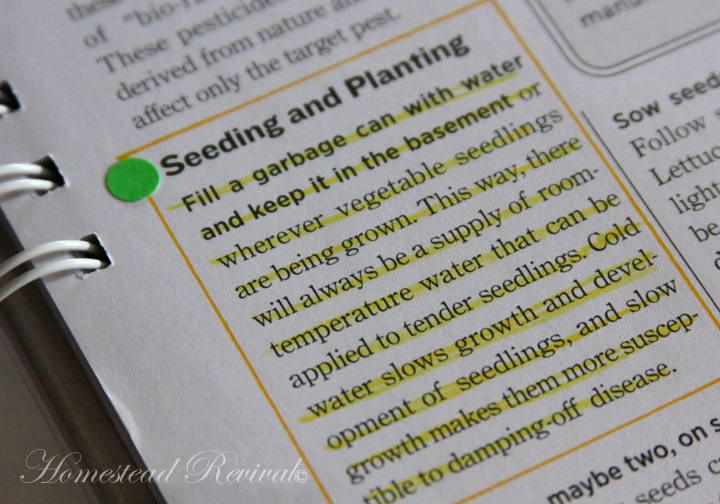 The handbook has this covered, from soil to dead heading plants. • Harvest. You may think you won't forget to harvest the produce, but think again... ever find one of those great big gigantic zucchinis in the garden? And what about how you'll put it up for later? 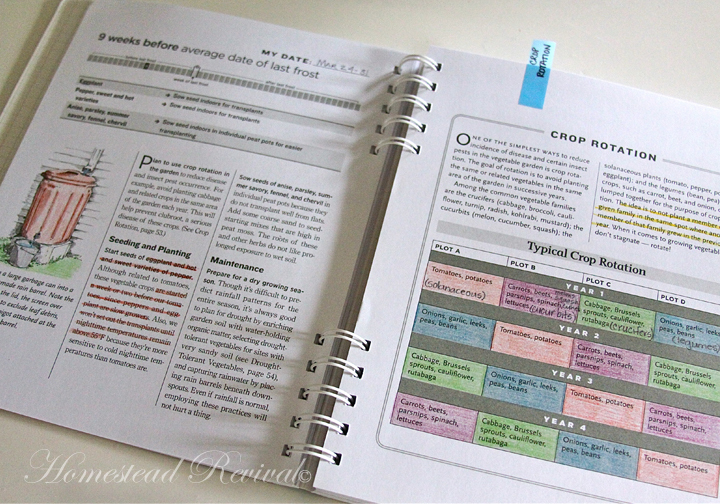 The handbook makes suggestions to keep you eating all year long. Oh, and it tells you when to know something is ready... I could use help with that! A section in the back discusses the various methods in brief as well. • Tips and ideas. Interspersed among all the weekly "to-do" lists, you'll find an enormous wealth of tips conveniently inserted during the time of year you need to know! This is HUGE! How many times have you seen a great book with ideas, but totally forgot to implement any of the things you learned? I like to highlight my favorites I plan to try. • Journal. This page, inserted about every 3-4 weeks, allows you to record what you accomplished for a 3 year period. It's helpful to know the following year what worked or didn't work specifically for you. At $14.95 ($10.67 at Amazon), this handbook will certainly give you a large return for your investment. I suspect it will pay for itself many times over at my house! And did I mention that everything is based on organic gardening? Yes... I'm definitely smitten with this book. I think I'll love it even more after 3 years of coloring, notes, tags, inspiration, and perhaps some incredibly bountiful harvests!